HEM Vanilla 20 x 9 inch hand rolled incense stick hex pack. The pure and refreshing scent of fresh vanilla is one of the most popular fragrances in the HEM "Regal" range. 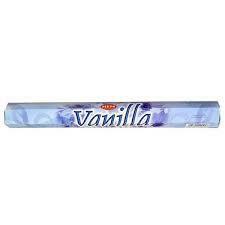 Vanilla fragrance was used by the Aztecs to reduce stress and anziety.